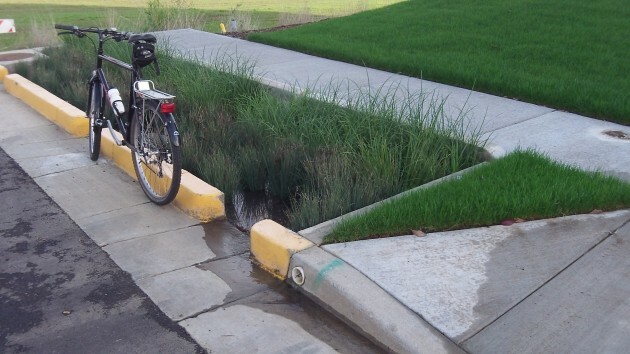 » Drainage news: Behold a working bioswale! Drainage news: Behold a working bioswale! As landscaping, this feature is more useful than grass. In September, the city council enacted this program on a 4-3 vote, with the mayor casting the tie breaker. 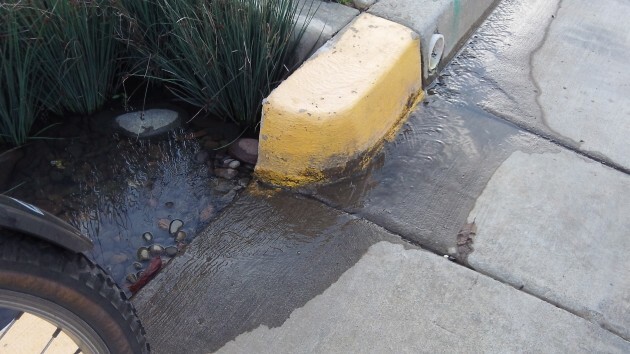 The opponents were concerned about the added cost in construction and fees, but the city administration says the program is necessary to comply with state and federal regulations to keep pollution out of our waterways. Even before they were generally required, over the last few years “bioswales” or “rain gardens” have been installed in various places around town, including Albany Station and on Broadalbin Street downtown. The one I saw doing its job — disposing of runoff and keeping it out of the storm sewers — was on a new street in North Albany. Please check an early attempt in Corvallis. The parking lot next to the transit hub is made of pavers and grass “grout”. I have had interest in that location and now that almost forever has passed then maybe we can talk about how it worked out. There is an area in my town that needs work but the sewer is higher than the ground level. That over simplifies but is at least suggestive. The Corvallis parking lot is not as simple to build as it might look. The bioswale also looks simple. New approaches often take some time to work through bugs and prove themselves. Too bad so many people angrily denounce things like bio-swales and roundabouts for example, simply because they are new and represent a change to the old ways. Change is essential for progress to take place.